Hello Peeps! Welcome to Saturday. Cant believe its already AUGUST!! WOW! Seriously! Where is Summer going so fast? Have you played along with the current Challenge #HMFMC199, over at the House-Mouse and Friends Monday Challenge Blog? If not, there is still time! You have until MIDNIGHT tonight to enter for your chance to win fab prizes! The NEW theme is "House Mouse and A Friend" - or you can enter with an ANYTHING GOES too (as long as you use HMD stamps (House-Mouse, Gruffies and/or Happy Hoppers). Simply Click HERE to go directly there to enter the challenge! 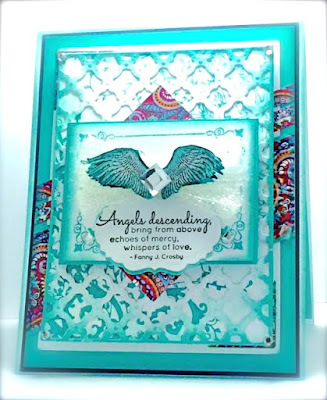 I'll be back later with the NEW ODBD August Release BLOG-HOP POST and then again with my very first Christmas Card of 2015 created with Creative Expressions Craft Dies designed by Sue Wilson! Check out all the NEW products at ODBD. This is so lovely! Thanks for joining us over at PDE Linky Party. Thanks for playing at PDE Linky Party! Oh wow - LOVE the colors, so bright and beautiful! Thank you for joining us at Crafts 4 Eternity! BEAUTIFUL and full of amazing details and lovely layering!! I am super impressed with this card!!! Thanks for joining us at “Simply Create Too” - hope to see you next time! !